Welcome To Snowbasin – Ultimate Mountain Luxury! With diverse terrain for beginner ease to challenging expert runs, Snowbasin also offers three progressive terrain parks and 26km of groomed Nordic trails. With 3,000 skiable acres and 3,000 vertical feet, Snowbasin is best known for wide-open bowls, gladed runs, manicured groomers, powder stashes days after a storm, and rarely a lift line. Snowbasin has world-class snowmaking and one of the most advanced lift systems in the West. Enjoy award-winning cuisine including mountaintop dining with spectacular views and magnificent day lodges. Make the most of day on the mountain with more than 100 certified instructors, adaptive programs, state-licensed day care and children’s programs. And for more family fun, don’t miss the four-lane lift assisted tubing hill. 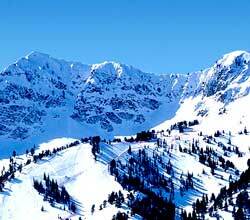 Snowbasin is just 35 miles north of Salt Lake City with easy access to the Park City Area. Après ski in Downtown Ogden, just 17 miles away. Find out why Snowbasin is consistently recognized as one of the best of the best! 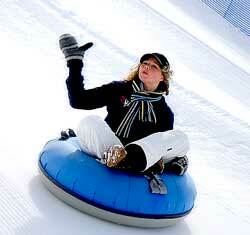 Our lift assisted four-lane tubing hill provides family fun for all ages! Located at the former finish line area of the 2002 Downhill courses, visit the Snowbasin tubing hill for an exhilarating ride. Access is provided by a handle tow lift, and a rubber tube is included with your ticket. The resort shuttle stops close to the tubing hill every 20 minutes to take tubers to Earl’s Lodge and the Grizzly Center. During the winter season, the tubing hill is open every Saturday and Sunday, as well as Monday holidays from 10am to 4pm.